Before I dig into the nitty gritty of this potentially sweet trade setup, I would like to first wish everyone a Merry Christmas and Happy Holiday! Being from Canada I’m very lucky to be able to spend quality time with my family for the next month down in the sunshine state of Florida. I sure love the ocean breeze, sand between the toes, palm trees, and heat. Its amazing how cold Floridians make a sunny 70-degree day look being all bundled up in pants, jackets, and hats, while I live in my bathing suit practically the entire time I’m down here. I don’t put on pants or a sweater until its 65ish out side or a restaurant demands I must wear pants and I’m still sweating wearing all that clothing. Its great to be back in America! Ok, lets get back to this sweet trade setting up! In this article I show you my analysis and share my thoughts on what is likely to take place with sugar looking forward 2-3 months if not longer. Instead of writing a long article I have attached three charts which clearly show my thinking and price projections. The monthly chart moves as slow as molasses for trading and investing but it does provide valuable information. The key data it shows us are the major trend, support and resistance levels, and potential reversal signals via candle stick patterns. Typically, if a chart shows a long lower or upper wick it signals price has found either support or resistance and a change in direction is likely to occur. The chart below is currently showing up what I call “Tweezers”. Two candles both with long upper wicks which tells us seller are present and selling into the buying pressure. 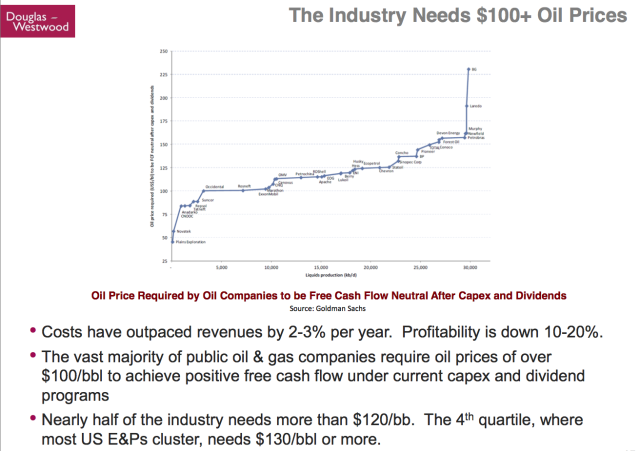 This is a great signal that lower prices are very possible. You should keep in mind that we are only half way through the month of December which means this candle still has another 10+ days of trading before it closes. So this is not a true tweeze pattern until the month is over. This chart below shows some very interesting data which one of my subscribers pointed out a couple weeks ago. 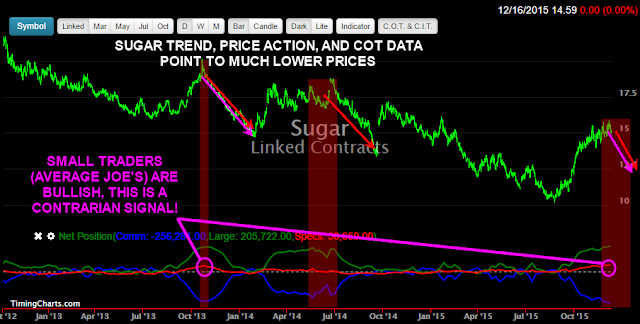 I have been watching the price of sugar waiting for a potential setup to form and it looks as though the time has come which I will show in more detail later in this article. What I like most about this information is the COT data. Specifically, the spec traders position which show the average joe/gamblers are all very bullish trying to get their sugar fix J. Typically, the small spec positions are based on emotions and when everyone is doing something, people don’t like to be left behind so they follow the herd mentality, BUY BUY BUY! As you can see in the recent trading the price of sugar has been chopping around with increased volatility, which tells me sellers are entering the market. Below I have laid out visually the key resistance levels for sugar. 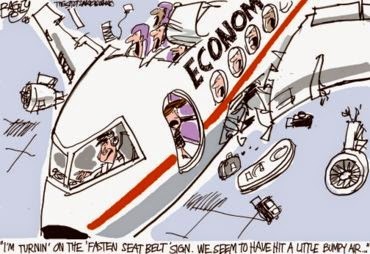 Ideally the sooner price breaks down the lower price is likely to fall as it will have strong momentum. 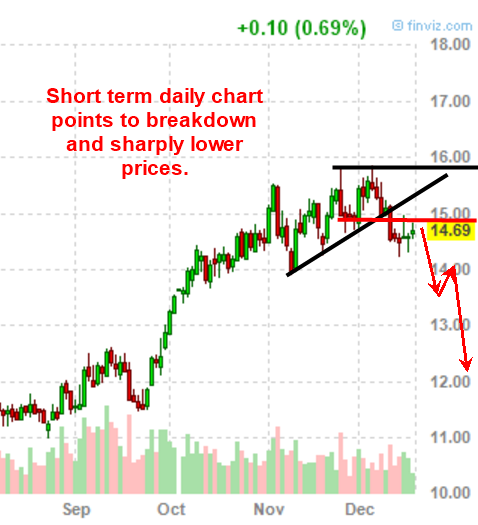 If price lingers and moves above the $15 level for several days, then it wont be as bearish of a setup in my opinion. The breakdown that I have drawn on the chart with red arrows shows the best case scenario. Unfortunately, there is not an inverse EFT for sugar. For one to profit from falling sugar you will need to short sell the sugar ETF SGG. I should mention that earlier this week I sent out a great trading opportunity that would allow you to easily trade indexes, all commodities, currencies and even the most popular 50 stocks using what I use. Its commission free trading, you can trade 24 hours a day, and place any position size you want as little as $15 on sugar or the SP500 index. 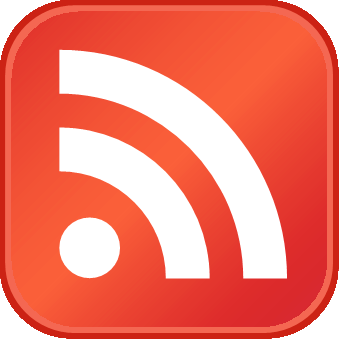 It’s the ultimate way to learn to trade while trading live without losing a ton of money. And to sweeten the deal, if you use my special link here you can get free trading cash to start! 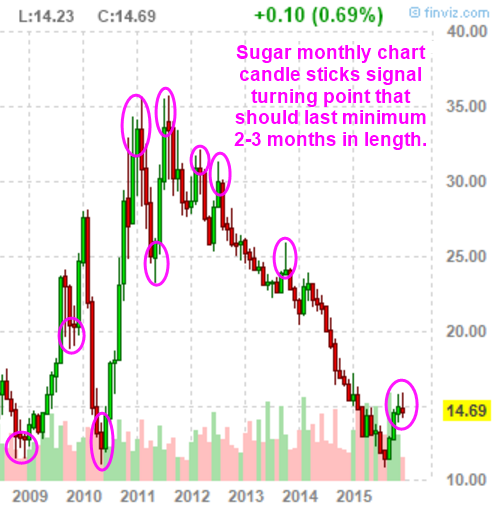 In short, I think sugar is/has setup for a short trade and will fall over the coming months. Nothing in the financial market is for certain but I do like this trade setup for a small speculative position. Stay tuned for more trading ideas as I have a great Holiday Gift Idea and Trade that I will share in a few days… So get on my email list, or join my premium trade alert newsletter and get all my trades, analysis and educational videos so you can master the markets and profit for life!